Agarwal Group is the formidable force behind evolution of a strong and entertaining concept like Nakhrali Dhani. Not being limited to one but being diversified into many different business areas, Agrawal group has set a raised standard of commitment. Agrawal group is inspired by the phenomena of achieving growth by bringing strategic decisions to fruition and leaving behind a testimony of ardent endeavours. Led by the group chairman Mr. Purushottam Kumar Agarwal, who started his journey by booking trucks for coal transportation, Agarwal Group turned out to be most influencing business empires in the central India. With the continued support of the Vice Chairmen, Shri Vinod Kumar Agarwal and Shri Sanjay Kumar Agarwal, Agrawal group is led on an endless journey towards triumph by maintaining a sheer belief in team-work. Transforming the conservative business formulae, Agarwal group has always strived to be in the frontline of technological innovation keeping pace with the business processes. Standing as an idealistic business benchmark, Agarwal Group has expanded its business into diverse spheres like- Education (Schools and Colleges and Book publishing), High-end resort, Marriage Garden, recreation (Water Park), Flour Mills and quality Real Estate Construction and development. Inheriting a deep commercial insight, a level-headed approach and an audacious will-power, Mr. Sanjay Agarwal, the Managing Director of Nakhrali Dhani has defied all odds and has flourishingly placed Agrawal Group on the pinnacles of progress. Inspired from the strong and determined personality of his father and blessed by beloved mother’s affection, he began his business pursuit at a tender age. In spite of the odds which came into his way, he continued his persistent business endeavours on the path of success. Mr. Agarwal is a true professional at heart and strictly follows the rules and regulations when it comes to business. He believes in fulfilling the business promises and thus adopts a strategic business approach which could lead him to live up to his commitments. Nakhrali Dhani has an in-built temple inspired from one of the places of religious importance, Salasar where the devotees extend their prayers to Lord Hanuman. The temple of Salasar Balaji is situated at town of Salasar near Sujangarh in Churu district Rajasthan. Since, the whole concept of the village resort Nakhrali Dhani is based on the village culture of Rajasthan, this temple is built to bring a natural and original feel of Rajasthan’s cultural importance where Salasar mandir holds a special place. Nakhrali Dhani blends Rajasthani and Malwi culture and presents before the visitors a never-ending charm and magnificence to imbibe them into the celebration. Every evening, the resort looks decorated as marvellous as that of a typical village exhibiting Rajasthani traditional elements. Beginning with a warm greeting at the entrance by Aarti and kumkum, the royal treatment further fills into the visitor an elated sense of excitement through- fun fair like environment. It inculcates- traditional dance performances by Rajasthani dancers, entertaining Puppet shows, Bullock Cart Rides, Camel ride, magic show, Horse ride and indeed a sumptuous Rajasthani meal. 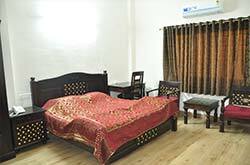 The village resort also includes- a clean and hygienic swimming pool, a dance zone and a separate dining hall with low rise sittings and a affectionately served food. The mouth-watering cuisines served in the large dining hall are a treat of lifetime. The royal welcome, humble serving of food in the style of Manuhar and the blend of love and kinship into the served cuisine itself works as the soul-satisfier. Nakhrali Dhani is synonym to excitement. Inherited from the prosperous culture of Rajasthan and reflected into each element of entertainment, Nakhrali Dhani is a speculum of cultural treasure of a vibrant state like Rajasthan. It is an outstanding concept which was evolved with a thought of engrossing common people into the world-famous Rajasthani style of celebration and gesture. Initially, the Rajasthani ambience was just a part of the restaurant offering. But slowly and gradually it caught the nerves of fun loving and foodie people of Indore. And thus, the Rajasthani theme was extended to create a Village resort. Since 1995, Nakhrali Dhani, the symbol of ethnicity has been renowned as a beginner of eventful evenings and blissful nights of people in Indore as well as the vicinity. Spread over a vast area of 28 acres, it is one of the major attractions in the city which entertains and amuses each of the visitors with its extraordinary offerings to make every moment memorable. Wedding is the most important day in anyone’s life as it celebrates the commitment of being together for lifetime. Nakhrali Dhani rajwadi, an astounding marriage garden strives to make one’s wedding a memorable occasion. Being wedded into a Royal and luxurious ambience is everyone’s dream and Nakhrali Dhani Rajwadi fulfils this dream by conceptualising a royal wedding decoration with affluent services. It is a triangle marriage garden which can accommodate 300 guests at a time. 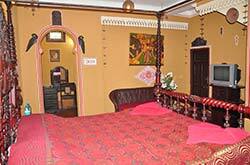 It also houses a banquet hall accompanied with a wash area, Kitchen, two rooms and a stage. It also owns a big lawn where about 1500 guests can be attended at a time. It homes 17 centrally air conditioned rooms, two gas banks, two store houses, two modern kitchens with a separate wash area, phera chauri and ample of parking space.